You might regularly clean the outside of your car, whether you break out the buckets and soap, or take it through an automatic car wash. Unless you get your car detailed somewhat as often, do your seats get the same care? Your leather seats see a lot of wear and tear. Whether you spill your morning coffee, your kids drop their snacks or just regular use from your daily long commute, your leather seats need some TLC. Here are some tips on how to clean them properly. As with cleaning anything, check the manual if available. 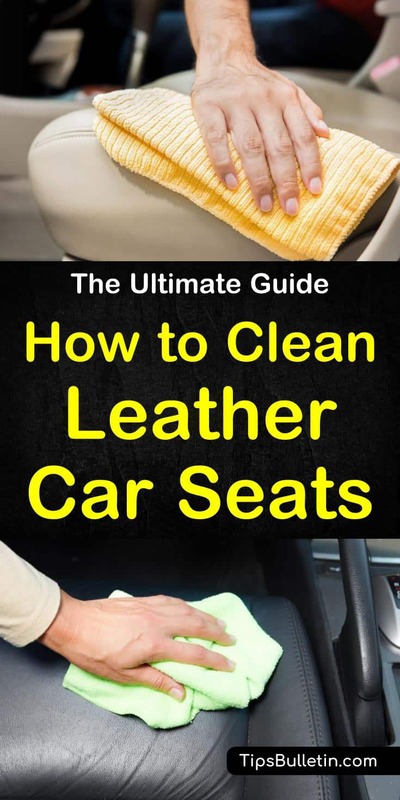 This will give you tips on how to clean leather car seats and what products are best or worst to use. Start by vacuuming your seats to get rid of any dust or crumbs. A brush attachment is best. If you don’t have access to a vacuum outside, you can also blow the crumbs away with a can of compressed air. Follow up the vacuuming with one of your cleaning cloths lightly dampened with water. Test your leather cleaner in a hidden spot to make sure it doesn’t discolor your seats. It doesn’t matter if they’re clean if your cleaner has ruined your seats. Apply your leather cleaner to your cloth and wipe down seats to remove grime. Then apply a small amount of cleaner directly to the seats and use the brush in circular motions to bring up more dirt. If your seats have tiny holes throughout, apply the cleaner to the brush instead. Be careful of any damage or tears as well so as to not get any liquid inside your seats. Once you have thoroughly wiped down and brushed your seats, wipe dry with another microfiber cloth. One shortcut to cleaning your car seats is to buy leather cleaning wipes. They clean and condition your leather seats all in one go. 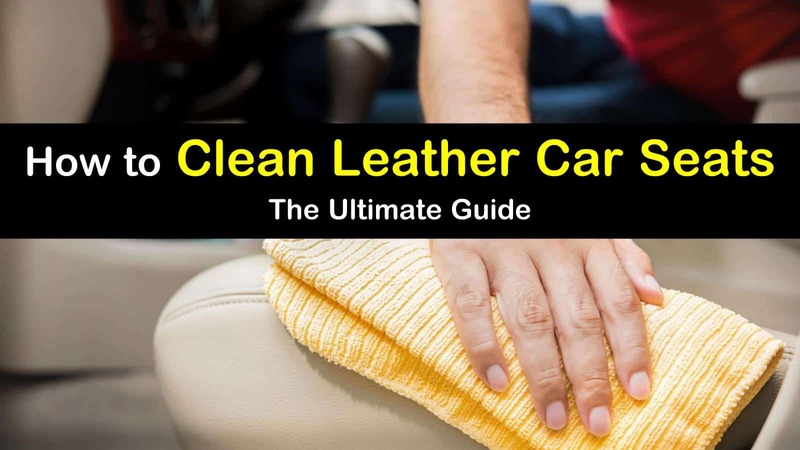 If you don’t want to use a commercial leather cleaner or don’t know what to use to clean leather car seats, there are a few different products you can use. You can make natural cleaner for leather quite easily. As with any cleaner, make sure it doesn’t damage or stain your seats before using. Place in a spray bottle for ease of use. Spray on a soft towel and gently rub leather to clean. You can use powdered laundry detergent as a car seat cleaner, but check it in a hidden area first to make sure it doesn’t stain. Add one teaspoon to a spray bottle filled with warm water. Use as a regular leather cleaner, making sure not to oversaturate your seats, and rubbing it in with a clean microfiber cloth. Follow with a spray of plain warm water to rinse. Let dry. Plain white vinegar can be used as well as a DIY car interior cleaner. Fill a spray bottle with 3 parts vinegar to 1 part warm water. Spray on seats and rub in with a clean cloth. Rinse with plain warm water and let dry. Vinegar can also be mixed with olive oil as a leave-in cleaner. Mix 1 part vinegar with 2 parts olive oil and spray on seats, letting it sit for just a few minutes. Then wipe it down with a clean microfiber cloth. There are a few household products that are good for removing stains from leather car seats. If you have a greasy or oily stain on your seats, sprinkle baking soda on the spot. Rub in with a cloth moistened with water and then let it sit overnight. Wipe it off in the morning with a dry cloth and then a damp one. Wipe dry. White toothpaste can get rid of some stains, including scuffs. Using a toothbrush, gently massage toothpaste into the stain. Then wipe with a damp cloth and let dry. Remove ink from leather car seats with alcohol or nail polish remover. With a cotton swab or ball, blot the stain with the liquid until it is removed. Clean the seat afterward as advised above. For light leather seats, you can try a paste made from cream of tartar and lemon juice. Mix 1 part lemon juice with 1 part cream of tartar until it forms a paste. Let it sit on the stain for up to half an hour before wiping with a damp cloth. This can bleach your fabric, so test it in a hidden area. It is possible to repair cracks in your leather seats. This can happen if they are very dry and warm. You can buy a repair kit for leather seats that contains a dye that matches your seats. Here is how to prepare your seats for repair. Apply dish soap and water to the seat to clean it gently. Then with the same rag, rinsed out, apply denatured alcohol to the area. Dry with a microfiber cloth. Using fine sandpaper, sand down the edges of the cracks so that they are smooth. Then use your leather seat repair kit according to instructions in order to seal and dye the crack, and let dry completely. Regular cleaning and maintenance will prevent your seats from cracking. Go through this cleaning routine up to four times a year, and clean up any spills immediately. Conditioning your leather seats will go a long way towards preventing cracks and keeping your car looking brand new. Leather contains natural oils, so you want to buy a conditioner that will restore them, and not one that contains waxes or silicone. These can leave your seats feeling greasy. Like with all leather cleaners, test your conditioner in a hidden spot to make sure it doesn’t react badly with your leather seats. Apply a small bit of conditioner to your seats and massage in with a microfiber cloth. Go over the seat again with a clean cloth to make sure there is no excess buildup. Let your car dry completely overnight out of direct sunlight. After the conditioner has soaked in, use a microfiber cloth to rub the surface and buff to a shine. If you only clean your seats a few times a year, do this each time to keep your seats looking great.